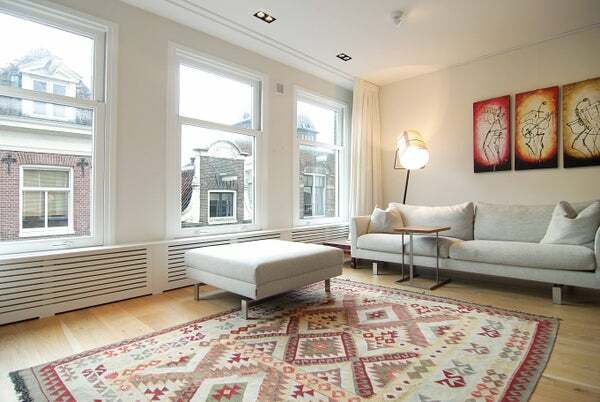 Gorgeous, newly renovated and very bright, fully furnished 3-bedroom apartment located centrally in the popular Jordaan area of the center of Amsterdam. This specious apartment has 3 good bedrooms, 1 and a half bath, Sonos audio systems and a roof deck terrace. The apartment is located on the third and fourth floor, with its entrance on the second floor. One enters with a small hallway and a staircase going to the main floor. On the main, third, floor one finds a spacious set up and the three south facing windows make this a very comfortable and light room. The full kitchen, with all modern amenities one can imagine is in the back. In front and to the side of the kitchen there is a dining area with seating for up to 8. A separate toilet with two doors for secure privacy and the staircase going both up and down is in the middle of the spacious main living floor. In the front of this floor you will find a nice lounge area with a comfortable sofa and TV. The three windows facing south ensure lots of light all year round. On flight up there is a large open landing that lead into three bedrooms (one office), a washer/dryer cabinet and a large bathroom. The bathroom has a skylight, wash basin, towel heater, toilet, separate shower and large bath. The master bedroom is located in the front and has a lot of cabinet space. The second bedroom is located in the back and leads to the 12m2 roof deck terrace in the back. The third bedroom is currently set up as an office. Uw partner bij het vinden van de perfecte woning!